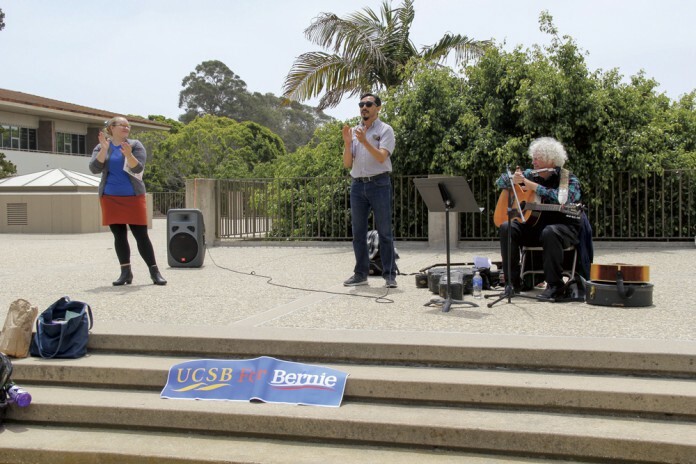 Students, workers, faculty and union members of the University of California, Santa Barbara joined together on Monday, May 2, for a “May Day Rally and Teach-In” on the Storke Tower Lawn. Speakers at the event included Eileen Boris of UCSB’s Feminist Studies Department, Field Representative Cameron Schunk from the Office of Assemblymember Das Williams, Marcelino Sepulveda of University Council-AFT, Kat Swift of the UCSB Graduate Student Association, Erika Ito of United Students Against Sweatshops and Andrew Pragin, representing Jay Freeman’s county supervisor campaign. Aviva Milner-Brage, organizer for both postdoctoral union UAW 5810 and student-worker union UAW 2865, hosted the event. Boris said that teachers, nurses, home health care workers and domestic and household workers are at the center of the current labor movement. “These workers are predominantly women, and disproportionately women of color,” she said. Boris argued that these workers need better protections, as their work often is low-pay, part-time and precarious. She called on the audience to support Senate Bill 1015, the “Domestic Worker Bill of Rights,” which would keep an older state law granting overtime protections to domestic workers from sunsetting in 2017. “Let us today not only dedicate ourselves to recognized workplaces, but remembering that justice begins at home, and my home can be your workplace,” she said. Sepulveda spoke specifically about the UC system and its treatment of lecturers. He said that unlike tenured faculty, lecturers — who teach over one-third of undergraduate credits — are contracted, part-time workers that often earn very little. Sepulveda celebrated the recent negotiation of a contract for lecturers that will increase their salaries by 11 percent over the next three years. However, he emphasized that there is more work to be done, especially when it comes to lecturers’ job security. Ito began her speech by emphasizing that she was not only speaking on behalf of international workers, but also for those who could not attend the rally because they were working. She discussed past successes of United Students Against Sweatshops and also spoke of their ongoing efforts for increased transparency regarding the working conditions of the agencies that the UC works with. Between speakers, folk musician and activist Ross Altman performed. He played labor movement anthems such as “Solidarity Forever” and his original “May Day.” With lyrics such as, “May Day is all around you/It’s everywhere you look/It’s not just in the dusty pages of some history book,” Altman encouraged audience members to treat every day as if it were May Day. In an interview with The Bottom Line, Eric Villalobos, a third-year religious studies major and head organizer for UCSB for Bernie, commented on why UCSB for Bernie decided to collaborate on the May Day rally.